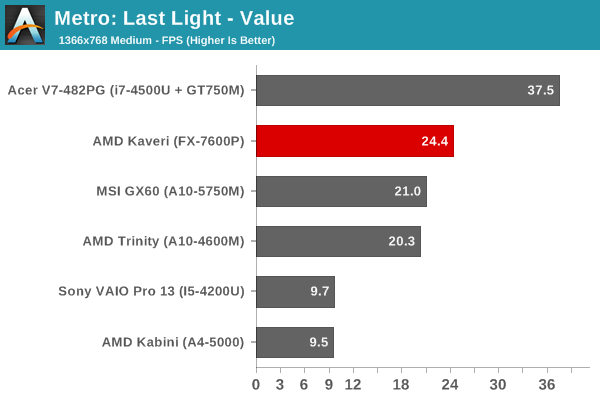 Given the 3DMark results we just showed as well as the increase in CPU performance, I was very interested to see what Kaveri could do in terms of gaming performance. Here I have to temper my comments somewhat by simply noting that the graphics drivers on the prototype laptops did not appear to be fully optimized. 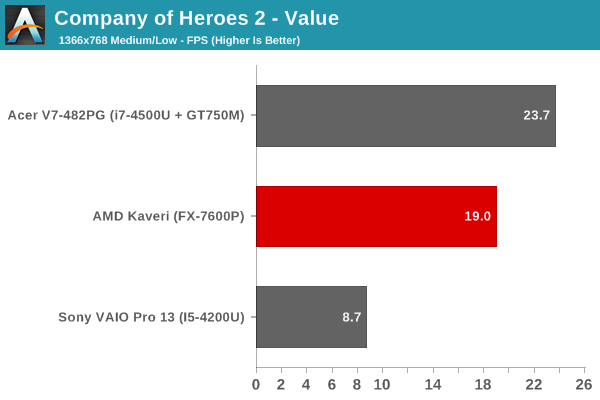 One game in particular that I tested (Batman: Arkham Origins) seemed to struggle more than I expected, and there are other games (Metro: Last Light and Company of Heroes 2) that will bring anything short of a mainstream dGPU to its knees. 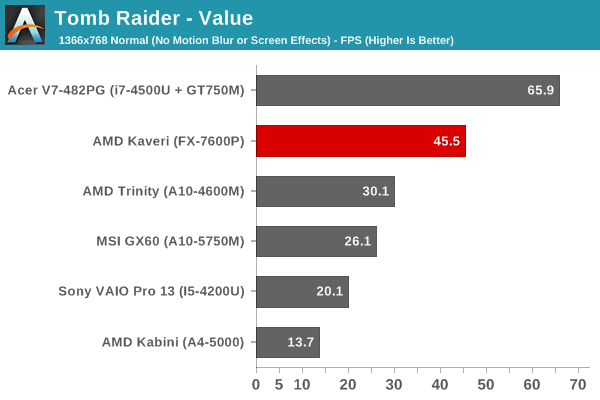 I've posted the Kaveri Mainstream and Enthusiast scores in Mobile Bench, but they're not particularly useful as most of the scores are below 30 FPS. Here, I'll focus on our "Value" settings, which are actually still quite nice looking (Medium detail in most games). As expected, in most of the tests the Kaveri APU is able to surpass the gaming performance of every other iGPU, and in some cases it even comes moderately close to a discrete mainstream dGPU. 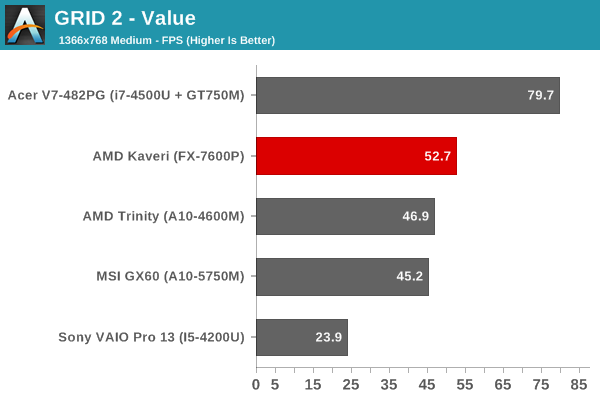 There's a sizeable gap between the Trinity/Richland APUs and Kaveri in most of the games I tested, which is great news for those looking for a laptop that won't break the bank but can still run most modern games. 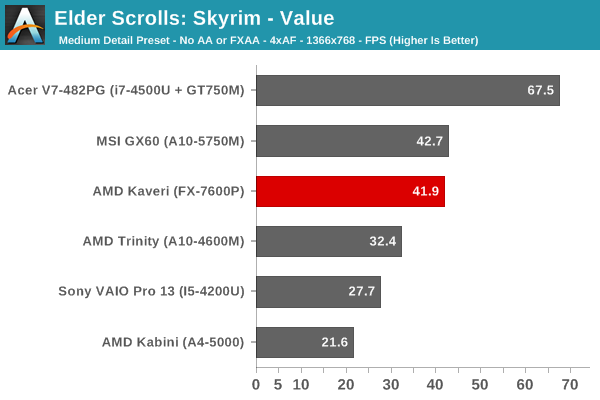 Getting into the particulars, Skyrim seems to be hitting some bottleneck (possibly CPU, though even then I'd expect Kaveri to be faster than Richland), but the vast majority of games should run at more than 30 FPS. There was one system with a pre-release Mantle driver installed that was running Battlefield 4 reasonably well at low/medium details, and with shipping laptops and drivers (and perhaps DDR3-2133 RAM) I suspect even Metro might get close to 30 FPS. Of course, we're only looking at the top performance FX-7600P here, so we'll have to see what the various 19W APUs are able to manage in similar tests.